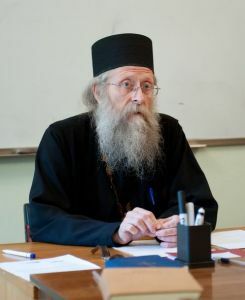 On June 8, 2012, Archpriest Gennady Fast – Rector of the Church of Sts. Constantine and Helen in Abakan (Republic of Khakassia, Russia) and author of several fundamental works in the field of Biblical studies – gave a talk to students of the Moscow Theological Academy. Following his lecture, Fr. 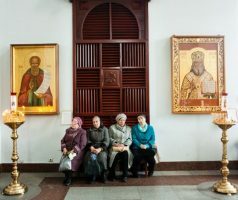 Gennady replied to questions addressed to him by Archpriest Leonid Grilikhes, head of the Department of Biblical Studies at the Moscow Theological Academy. Fr. Gennady, we are very grateful to you for meeting with the students of our academy and conducting a seminar on the Song of Songs. Meeting with you is always a “feast” of Biblical study. Please tell us how you first became acquainted with the Bible. I come from a deeply pious Protestant family. Our mother helped my brother and me study Holy Scripture from childhood. We lived in Kazakhstan from the time I was two, and one might say that I grew up on Bible stories from a children’s Bible. When I was ten, my cousin brought me a small New Testament in German. It stunned me; I read it hiding behind the barn. This was one of the most powerful impressions of my childhood. I took delight in the Word, reading it in my native German; it touched my soul and called me to God. From that time forward I began to search for how to be born again. This became the most important thing in my life, even though I was only ten. Later, after we had moved to another city in Kazakhstan, we formed a Bible study group, where we often gathered. Later, as a university student, I encountered Orthodoxy. I discovered that I had been swimming in only a small lake, while Orthodoxy was an entire ocean. This concerned above all the works of the Holy Fathers, in which I immersed myself completely. I began my study of ancient languages later. The Bible has always been my daily reading. One reads it not just for information, or even just as something holy, but as the word of God, as food for the soul. Once, in a vision, the Prophet Ezekiel ate a book. For me, the Bible is bread. Your pastoral work is associated with Siberia, where the seed that the Lord planted in you at the age of ten is growing, as we now see. 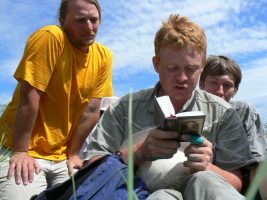 Fruit has sprung forth from the difficult Siberian soil in the form of the many people who have gathered around you, not only coming to God through you, but also becoming Biblical scholars. Please tell us more about them. We get together with the parishioners and conduct Bible studies. In this sense, ordinary parishioners become “Biblical scholars.” But there are also some for whom the word of God has become the subject of their theological and scholarly work. These include, for example, Fr. Alexander Klassen, who now teaches at the Tomsk Theological Seminary, and Deacon Roman Staudinger, who also teaches there. Deacon Roman wrote his thesis in Biblical studies, on “The Image of the Prophet Jeremiah,” and is now working on a book on the same prophet. He has arrived at a sort of “Gospel according to Jeremiah.” There is also Fr. Andrei Sokolov, who received a good education in both Moscow and Rome. He has written a commentary on Joshua and Amos, and now wants to turn to a study of Hosea. These are Biblical scholars “to the bone.” Apart from them, there are also other priests and active parishioners who, although they do not write anything, still love the Bible very much and live by it. Now we have already moved to different places, but we continue to communicate and meet. Fr. Gennady, please tell us about your writings. My first book came out during the Soviet era, when there was no access to academic theology or literature. Nonetheless, theological reflection was kept alive in many people even then. It was impossible to extinguish, just as it was impossible to extinguish prayer. The first book was called Commentary on the Book of the Apocalypse and was compiled on the basis of the commentary of St. Andrew of Caesarea. Then I studied at the Moscow Theological Seminary and Academy as an external student, already a priest. For my dissertation topic I chose the interpretation of the Song of Songs. Then the work Studies on the Old Testament was compiled, based on lectures I had given at theological-pastoral courses in Krasnoyarsk. It was published in two volumes; the third has not yet appeared. 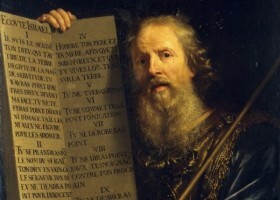 Then I put together a commentary on Ecclesiastes. At the present time, I am working on a commentary on Habakkuk (considering in particular the Biblical theme of theodicy). The particularities of my books are their use of ancient languages and Jewish tradition while, of course, having the commentaries of the Holy Fathers as their foundation. When considering Biblical texts, I make frequent use of images from classic literature as examples and illustrations.